Matt marched in the tournament today, for the first time! He went to many tournaments last year, but didn't get to march because he was wearing a neck brace. 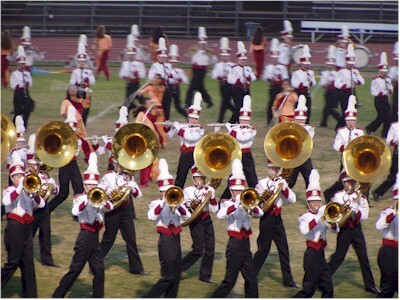 The marching band performed in the "Poway Preview of Champions" tonight and did quite well. Here they are with their brand new uniforms. Matt isn't in this photo. We had a busy day of driving today. Matt had left for a "Minitown" retreat in the Palomar Mountains yesterday morning. Susan, Scott, and I drove up to get him for the tournament, then back up after the tournament to deposit him among the cabins. It was nearly 2 hours each way! We enjoyed seeing the stars through our sunroof on the way back. We don't usually see the milky way, but it was bright as ever, thanks to our Santa Ana weather conditions (winds blowing from the desert, very clear skies).